ein hod: David Ilan: The PeaceDigger? Repatriation of artifacts excavated since 1967 in the Occupied Territories to the state in which they were originally found. Currently, the Israeli Archaeological Authority and the archaeology staff officer of the Israeli military's Civil Administration maintain control of all archaeological material excavated in Israel and some from the West Bank. 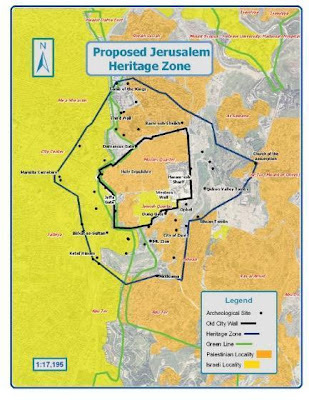 More than tripling of the footprint of that part of Jerusalem that would qualify for special protections as a UNESCO World Heritage Site to include the city's boundaries during the 10th century, or roughly the era of the Crusades. Currently, such status extends to a one-third-square-mile area that includes the Temple Mount, the Western Wall and the walls of Jerusalem's more than 2,000-year-old Old City. Ceding control over archaeological sites and artifacts to the state in which they reside and prohibiting the destruction of archaeological sites because of their cultural or religions affiliations. Currently, archaeological authorities on both sides of the conflict have been accused of being less careful about protecting and excavating archaeological sites and artifacts from cultures that are not their own. Consideration of archaeological sites that will straddle future international borders proposed under a peace plan to ensure that these borders do not divide or harm archaeological remains. Support for the establishment of museums, labs and storehouses for the protection, study and care of archaeological heritage where they currently do not exist, so that repatriation of materials to territories occupied by Israel in 1967 does not stall for the lack of such facilities. Representing the Israeli side are Rafael Greenberg of Tel Aviv University, and David Ilan, director of the Nelson Glueck School of Biblical Archeology at Hebrew Union College in Jerusalem.